Legiones Astartes (Warriors of Peace): All units with this special rule may always attempt to regroup regardless of casualties. The Way of Jin: All units with the Legiones Astartes: Warriors of Peace rule receive an immunity based on how many units are within six inches of them. If one unit is within six inches, the unit automatically passes Pinning tests. If two units are within six inches of the unit, the unit automatically passes Fear tests. If three units are within six inches of the unit, the unit automatically passes Morale tests. Martial Honor: All characters with the Legiones Astartes: Warriors of Peace rule must issue challenges when able. Unlike other legions, the Warriors of Peace approach warfare as one would any vocation. To them, warfare is their duty. Neither given into either the elation of slaughter or the despair of defeat, the Warriors of Peace maintain their stoicism in battle, no matter the odds they are against. It is only when a Warrior is at peace within himself does he achieve true mastery of the art of war. This eerie detachment, combined with the pariahs serving in their ranks, has intimidated both foe and friend alike. Among the few exceptions are, strangely, the Mechanicum. As the Warrior of Peace seeks to shed himself of fruitless emotion in battle, the tech-adept seeks to shed himself of fruitless flesh. Edited by Lord Thørn, 28 November 2017 - 09:34 PM. Fair enough. I like how you incorporate Chinese numerals into the legion now. It helps them stand apart from the others. Primary Legion Scheme: Lacquered/glossy black with crimson trim and accents. Occasionally metal elements may be used. Officer Corps and Distinguished Members of the Legion: Yellow or gold trim, stripes, patterns, or symbols. Can signify heroic deeds or recognition by a superior. However, many officers choose not to include such elements on their armour, usually to show humility. Armoured Units and Heavy Tanks: Azure cloth, trim, stripes, patterns or symbols. Many breacher shields bear Jin characters of protection brushed upon them in blue. Iron Monks and Pariahs: Grey or White robes, stripes, patterns or symbols. These units exist as a class apart from the main legion, and while the other colours can be used somewhat flexibly, these are reserved for a special breed of warrior. @simison: Yeah, using Roman numerals for a legion based on a completely different, non-European empire seemed kind of odd. Glad you like the idea. Now, some of you may be wondering why I changed the color system. After looking into Sim’s original color-coding method (an idea I rather like), I did some more research into the significance of colors in Chinese culture. The original legion colors were black and yellow, and the black I specifically made glossy to conjure up images of the lacquer that was often used as a material in Chinese decor. Yellow is the color of the Emperor in China, representing power and royalty. It is generally associated with higher social status, which is why I chose it for the heroes and officers. The next two colors are based mainly on their significance in Chinese opera masks, since I couldn’t find anything solid regarding their “main” cultural meaning. Green depicts a violent, ferocious character that lacks restraint. Not quite I want to convey, but it fits for the legion’s fast attack units. Meanwhile, blue is associated with stubbornness, staunchness and traditionally, immortality. Makes sense for heavily armored, intractable units like tanks or terminators. Grey is a neutral color and white symbolizes death and spirits, hence why Pariahs wear white and the Iron Monks grey. Well, there you have it. 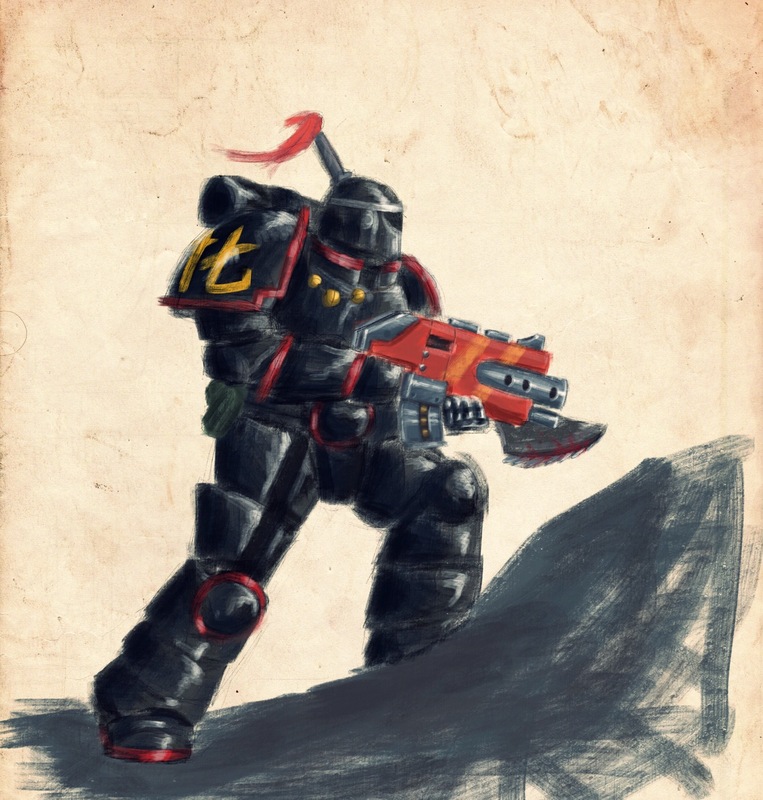 Incidentally, one of the things I had to do today was ask if I could alter one of my legions' color scheme slightly. Looks like I can. No apology needed. I think it was fairly obvious that I was stretched too thin between two legions and the project. Updated first post with LA rules. I haven't changed anything from when Simison made them (besides one of the rule names), as I think they're really solid. Isn't the XVII Legion the Word Bearers? Not in the Brotherhood of the Lost. Here the Word Bearers never existed. What he said, and welcome to the Brotherhood of the Lost! We know that it might be overwhelming for those who are unfamiliar with the setting. 'Here to start' is a good way to get a slight overview. Furthermore, I would recommend the pinned topics as they feature the most important informations. Don't hesitate to ask us, either via pm or per posting. We'll gladly answer your questions. One issue I might raise with the new rules Drak, I'm not sure the Martial Honour rule fits the Warriors' emotionless, logical approach to war, Captain Ju-Long being the exception. I don't see them accepting a challenge if it's tactically unsound or they obviously have no hope to win, that sounds more like something the Berzerkers or Lions would do. You do make a good point. In that case, any suggestions for a replacement rule that could present an equal drawback? Possibly something along the lines of must consolidate away from enemy units as they take a step back to assess the situation whenever they finish a combat? I don't know if they would need to take a step back in order to do that...But I think something to do with consolidating or post-assault phase is on the right track. Another idea is some kind of penalty for losing units, like maybe extra VPs? Hmm, how about they have to pass a leadership test to make a sweeping advance to represent them mentally weighing whether it's worth pursuing or not? That might work. It'd be further encouragement to have units close together, that way you can benefit even more from the auto-passing morale checks. Ah good point, I hadn't considered that, hurrah for happy accidents! The more thought I give to the sweeping advance rule that you suggested, Sangi, the more I think that it doesn't make that much sense for the Warriors of Peace. While they are quite "restrained" in battle, they are not pacifists by a long shot, despite what their name suggests. So they wouldn't be averse to finishing off fleeing enemies. Maybe instead of chasing after them and cutting them down they instead make a kind of Overwatch attack as they shoot down those who try to fall back? I believe that Iron Hand Immortals have something along those lines. It would mean that there is a chance of enemies surviving instead of automatically being swept and killed. Perhaps have a weakness tied to their discipline? Like the Ultramarines issue with their rigid command structure? @Grifftofer: Not sure if they would be the type to shoot down enemies over just doing it the old fashioned way. @simison: I like that suggestion, but I don't think it would be tied to their command structure. In my mind the Warriors are a bit more self-sufficient than the Ultras. What about some kind of disadvantage if they get caught in a sweeping advance? Might reflect somewhat nihilistic tendencies among the legion, sort of resigning themselves to their fate?